Sleeping in. Ah, what a wonderful concept. But with Cole, that has a whole new meaning. Sleeping in means sleeping IN something. He sleeps inside his tee pee during the summer, he often sleeps inside a sleeping bag on top of his bed, and sometimes it literally means sleeping IN...like IN a box. He's enjoyed this box for a week or so now. He has it full of pillows, blankets & a few select toys, as well as a direct view of the tv & full access to the Playstation. He even sits there playing Guitar Hero! 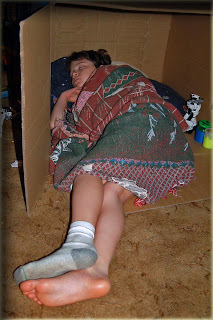 Last night he fell asleep in his box, so Blake took this picture. This morning Riley was TRYING to sleep in too, but he was rudely interrupted by Bobbin. 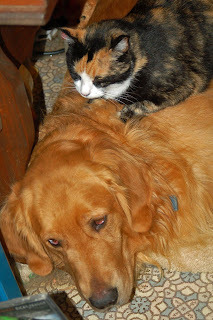 Bobbin decided she wanted to sleep in on TOP of Riley. 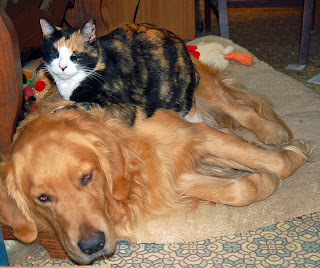 Her usual sleeping spot just didn't suit her for some unknown reason, and Riley's must have look comfortable. 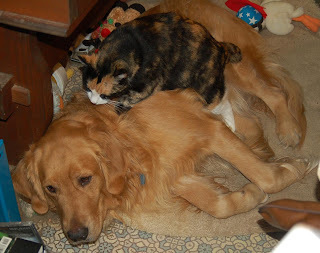 She carefully crawled up on top of Riley, and began 'kneading' him... to soften him up? I must say, Riley handled it with grace and long suffering sighs. He just laid there & let her make herself comfortable. I'm really not sure if he completely woke up during the whole procedure. His eyes opened, but he didn't really look like he was awake. It really looked just like an old Looney Toons Cartoon with the great big bulldog & the wee itty bitty kitty. Maybe Riley & Bobbin have spent too much time watching cartoons when we weren't looking! Something tells me that if Riley ever tries to sleep on Bobbin - it will be a whole different story. Early last summer our Pastor was busy getting ready for our new Contemporary Services in the Activities Center. 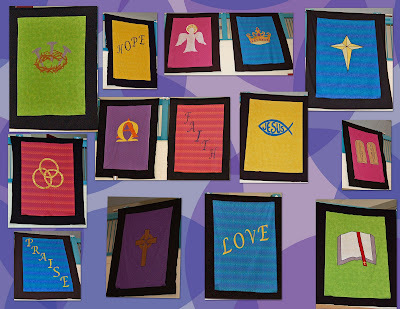 One day the mail arrived & I gave him a junk mail catalog full of some really pretty Praise banners. He was pondering the banners, but quite put off by the hefty prices of them. So me being me, glanced at them and promptly said 'We can make those!' Within days I was drafting the patterns on my EQ program, and a team of ladies & I were making them. It was a lot of fun working together, and I'm happy to say we got them all ready in time for the first service, too. They are really pretty, and help buffer the sound in the gym a bit. New Years Eve was the first time I've been in the gym with my camera. I took the pictures while the youth were playing volleyball, so some of the camera angles are not the best.